There’s nothing worse than having your new floor ruined in a single evening. We know; at RubberFlooringInc, we take our flooring pretty seriously. That is why we are proud to offer a generous selection of durable, high quality, protective gym floor coverings. Choose between large rolls and easy-to-install tiles to find a quick, easy and cost efficient bodyguard for your floor. Our gym floor covers come in a wide array of attractive colors and offers substantial warranties, ensuring your floor will be protected long into the future. Each of our gym floor covers offers slip resistance and meet all relevant safety standards, making them an excellent choice for schools, churches and more. Once you’ve chosen your gym floor covering, shop our selection of accessories to help you begin your floor protection. What are Gym Floor Covers? Many school events take place in the gym: graduation, prom, award ceremonies and so much more. When the chair unfolding starts, what’s there to protect the gym flooring? After all, some gyms feature beautiful hardwood for the perfect basketball game- no one wants that ruined! That’s where gym floor covers come in. 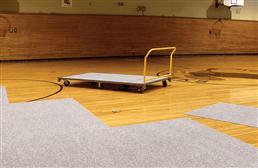 Gym floor covers are a floor protector that keeps gym flooring from being scuffed up by shoes, chairs and tables. Gym floor covers come in both rolls and tiles, so it’s easy to pick which one works best for your gym. Still not sure why you really need a gym floor cover? Let’s take a look! Do I Need a Gym Floor Cover? The answer to that question is yes, you do. Let us explain. Events are messy and a room full of people is even messier. Imagine the punch stains, crumbs, and constant scooting of chairs and tables at an assembly. It’s a recipe for a disaster for your gym floor! Not only that, it’s an expensive disaster. Scuffs and stains will take time and money to clean and buff out. 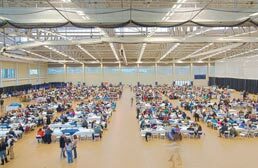 Gym floor covers aren’t just beneficial, they’re necessary for keeping your gym floor safe during events. Installing your floor protector isn’t difficult either. 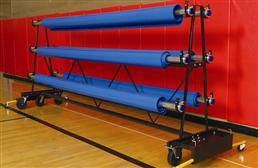 With storage racks and electric cranks, installing a gym floor cover can be a breeze. Weight: Gym floor covers come in several different weights. The weight of the cover helps determine its durability. Be sure to pick a weight that’s perfect for your use. Slip Resistant: Nobody wants guests slipping and sliding! Make sure your gym floor cover offers slip resistance. If you need extra slip resistance, grab a diamond pattern. Fire Codes: Safety first! A quality gym floor cover can always pass standard fire codes. Waterproof: If you predict your events will have spill risks, be sure to pick a vinyl gym cover that’s waterproof. Mold, Mildew and Anti-Bacterial: Lots of people will be on this gym floor cover. 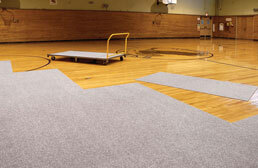 A quality gym floor cover will not be prone to any sort of growth caused by food and moisture. That means no mold, mildew, or bacteria. 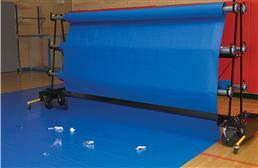 Gym floor cover rolls are large vinyl sheets that can be unrolled and rolled back up for easy installation and storage. 18 oz. - Best for 6 uses or less per year. 22 oz. - Best for 6-12 uses per year. 27 oz. - Best for 13-23 uses per year. 32 oz - Best for 24 or more uses per year. You can also purchase gym flooring cover rolls in different colors and lengths, so you can really customize it to match your space. 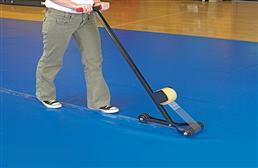 Vinyl gym flooring covers are also slip resistant, so there will be no sliding around! If you’re still worried about slipping, we also have a gym flooring cover with a diamond tread pattern. 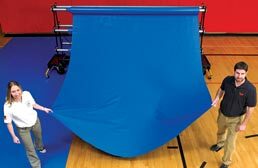 Gym floor cover rolls are the most popular option because they’re easy to install and roll out and great for larger spaces. They also are the easiest to clean. Gym floor cover tiles are large format, carpet topped tiles. They can be installed by simply following the direction of the arrows printed on the back and laid down. It’s a little more tedious than vinyl gym cover rolls, but you do get the benefit of a softer surface. Gym floor cover tiles are very durable and made from polypropylene fibers. In English, that means it cleans easily with vacuuming or a hot water extraction-cleaning machine for anything more stubborn. Each gym floor cover tile weighs about 14 lbs and has a special backing to keep it from slipping out of place. Once you lay these tiles, they’re there to stay. Tiles are great gym floor covers if you have a smaller space to cover, or if you want a more formal look to your event. Storage, cleaning, taping… all those are things nobody wants to think about. Luckily, we have some great gym floor cover accessories that make all those things easy to do! We want you to spend less time installing and maintaining and more time enjoying. If you’re buying vinyl gym floor rolls, you’re going to want a storage rack. 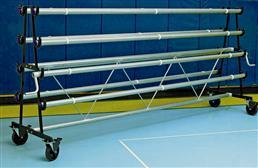 Storage racks make it simple and easy to install gym floor covers. They can hold 6, 8, or 10 rolls and up to 3,600 lbs. We offer two types of storage racks: standard and premium. The premium storage rack offers a few special features the standard version doesn’t: storage trays and six safety leg extenders. Safety leg extenders are great for multiple heavy rolls on a rack, as it helps stabilize the rack and keeps it from dangerously falling over. Storage racks can hold rolls that are up to 10’ wide. They cannot hold rolls 10 oz. or under. 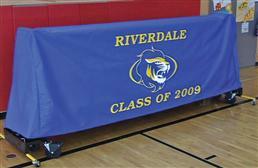 We also offer a storage rack cover that can be customized with a name and logo for school spirit. This handy tool attaches to your storage rack and nylon brushes push off any trash and debris left on your gym floor cover as it’s being rolled up. 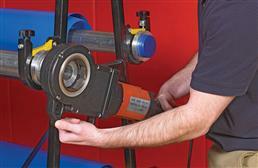 To really cut down on installation and removal time, get an electric power winder. Hand cranks can be pretty laborious, but an electric power winder is not! 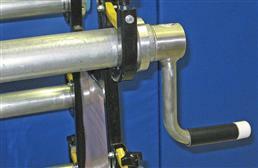 This electric power winder attaches to both storage racks and helps unroll and roll up vinyl gym floor covers. To be honest, covering seams with a handheld tape dispenser takes forever. 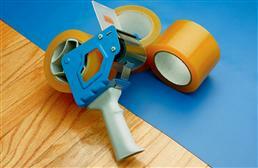 That’s why we also offer a walk behind tape dispenser. 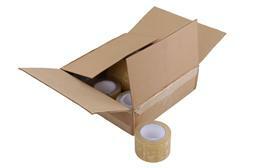 You’ll spend less time on your hands and knees on the floor, and more time simply walking and taping. It’s the faster alternative than a regular tape dispenser.